Let's keep in touch! Sign up for our tips on entertaining! Please enter your e-mail address and select your state of residence. 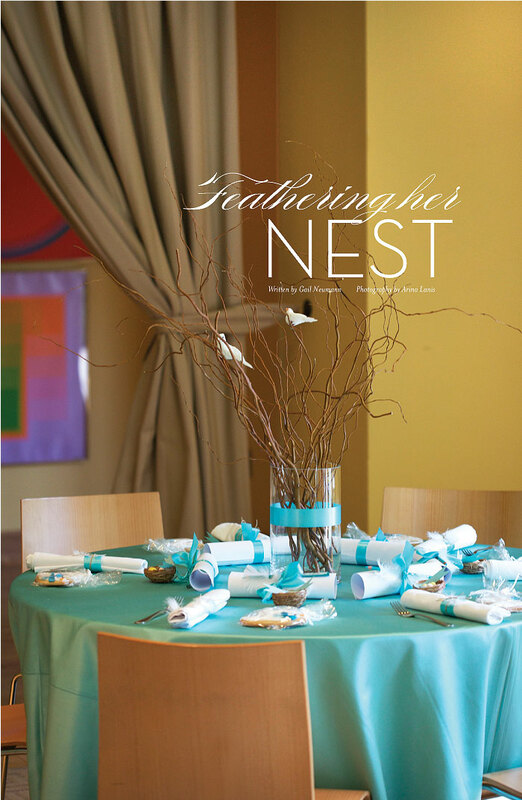 Feathering Her Nest – The Perfect Bridal Shower! When Marty Weinstock decided to host a bridal shower for the daughter of her dear friend Linda, she undoubtedly wanted it to be a very special and beautifully designed event. While working on a reception for an Edison Theatre production of “To Kill a Mockingbird,” it hit her that she could adapt her tablescapes for Jennifer’s bridal shower, held at the Zodiac Room at Neiman Marcus. Marty used grape vine branches in glass vases at each table, then perched two white doves (purchased at Michael’s) in the branches, like loving turtle doves. 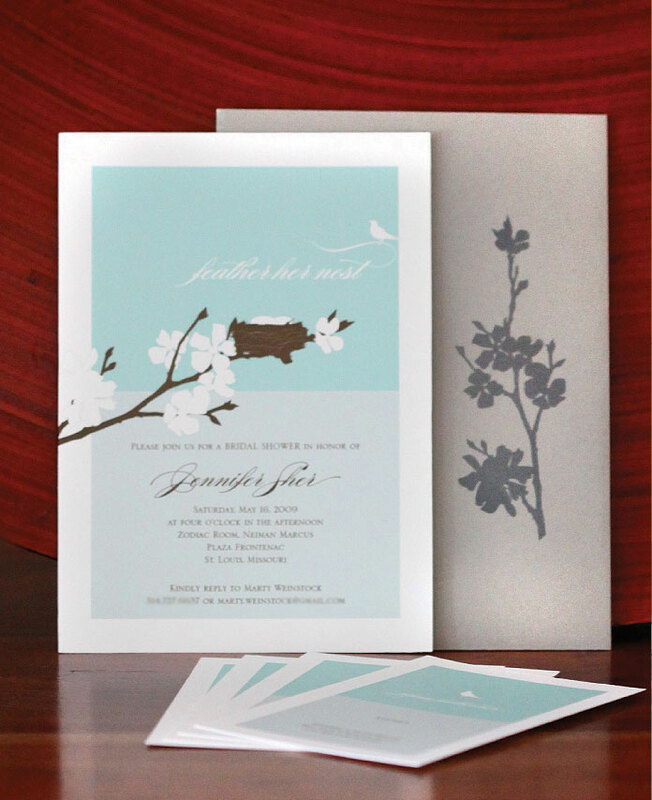 Marty’s daughter Leah came up with the phrase “Let’s feather Jennifer’s nest.” Leah works at a stationery store in Franklin, Tennessee, and commissioned the owner Lauren to design the invitation, incorporating the phrase. 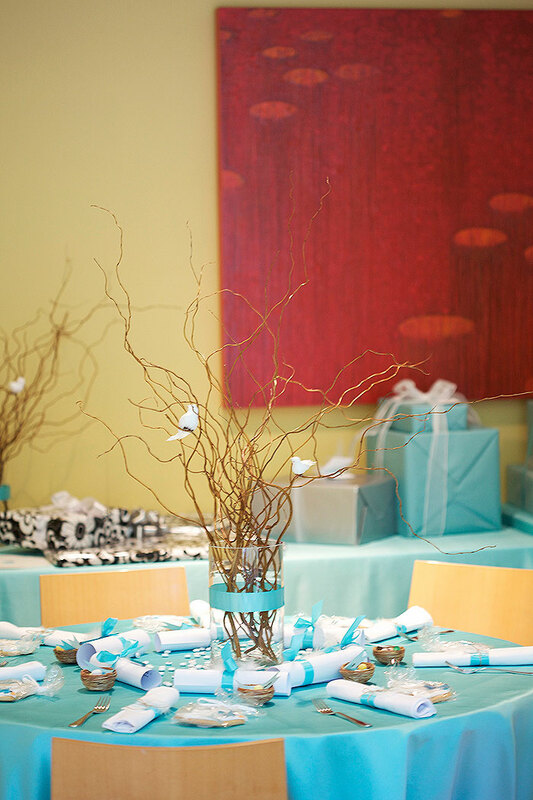 Lauren also came up with a beautiful invitation with brown branches and nest against a Tiffany blue sky; thus the color scheme was set. 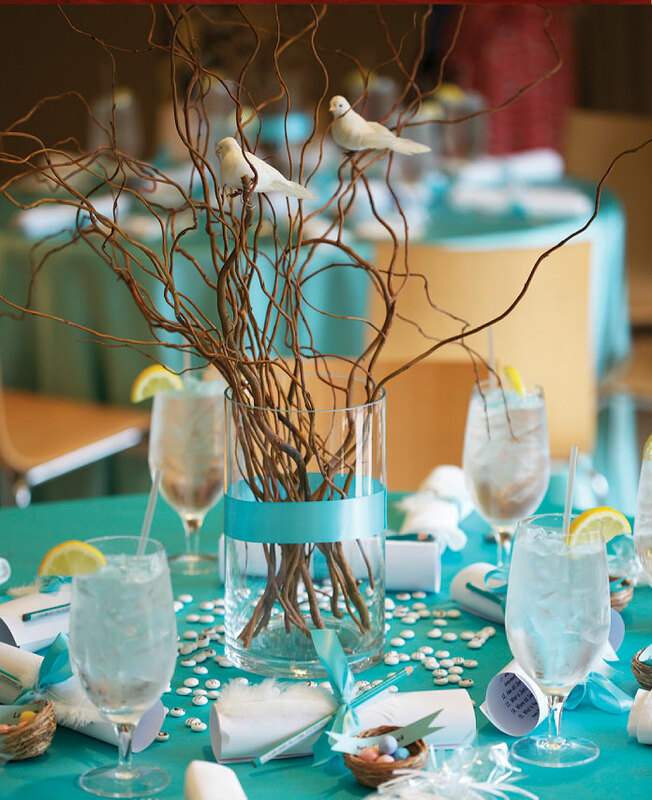 The Tiffany blue sky on the invitations inspired the colors for the tables. 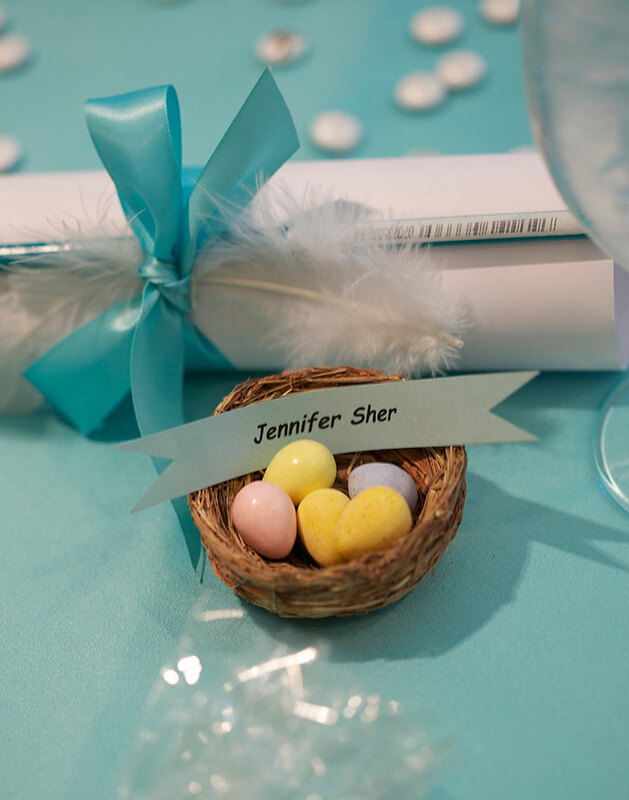 The stylish shower was infused with endless creative details, from white M & M’s with photos of bride and groom, to adorable place cards that looked like birds’ nests filled with candy eggs. To “liven” things up, Marty asked Jennifer to come up with 20 questions and answers for a fun party quiz that everyone enjoyed. 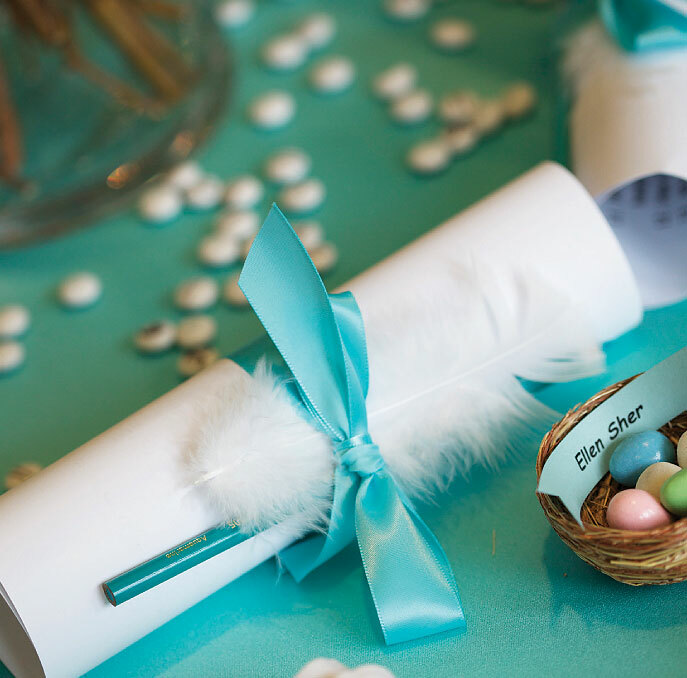 Tiffany blue pencils were secured to the paper with ribbon and a feather. It turned out to be not only an entertaining game but also a beautiful design element added to the table. 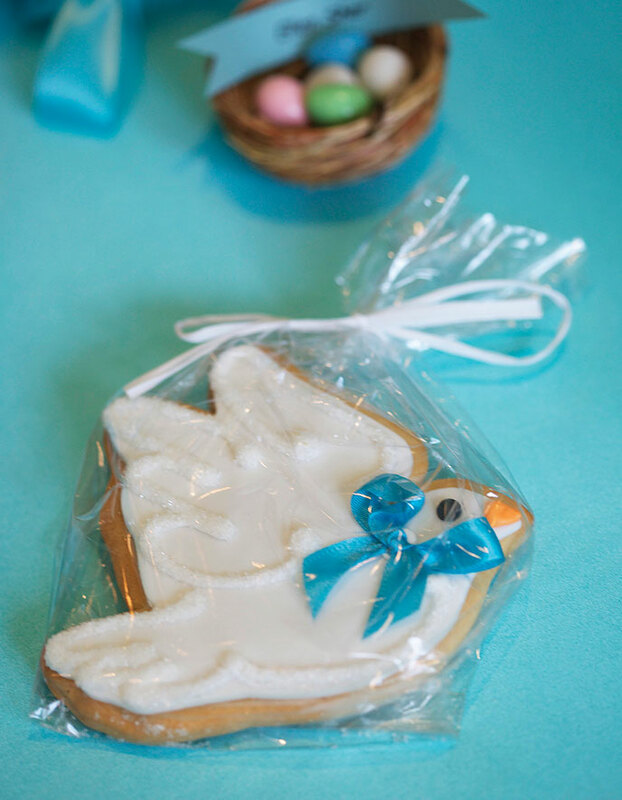 Last but certainly not least, each guest left with a beautiful dove cookie that Marty ordered through an online source. Of course the party was a success and every piece of creative detail enhanced the effort and led to a picture-perfect event that pleased Jennifer, her mother, and the family and friends in attendance. Visit Partytipz.com's profile on Pinterest. If you don't have an account, click here to create one. If you alreay have an account, click here to log in.